As soon as your roof is free from snow cover (more on this in item #3 below) perform a complete inspection and remove all debris, no matter how inconsequential it may seem. Check for loose shingles/tiles (as applicable) and other concerns. This inspection also includes the entire run of your gutter system which is at risk of clogging when debris is in the gutter channel. A clog will allow ice dams to form under freezing temperatures and will compound the problem with more winter sleet and snowfall and will ultimately damage your gutter system and consequently your roof, building exterior/interior, and foundation. Attend to any issues immediately, repairing where viable and replacing as necessary. If your business is located in an area with tall trees there are measures that you can take to prevent the debris (pine needles, twigs, branches) from landing on your roof and increasing the risk of damage. You will want to trim branches 8-10 feet from your roof and gutters. If you operate within a shared commercial complex (i.e. a strip mall) you will need to speak with fellow tenants and present your case to property management. A little effort can go a long way in keeping your roof safe from the strong winter winds that carry debris from nearby trees. 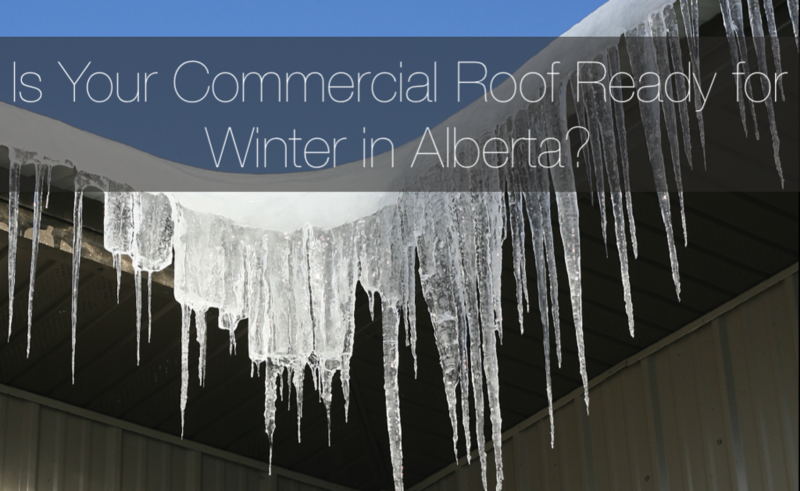 Many businesses wait a month or longer to remove snow from their roof. Some even think that it adds aesthetic appeal during the holidays, and while that may be true, it can set the table for water damage or worse. Snow not only directs contained moisture on to your shingles/tiles, it adds significant weight on your roof. The older the building, the higher the risk of collapse. Average Alberta snow weighs about 20 pounds per cubic foot. The National Research Council of Canada states that the minimum snow load a roof is required to handle is 21 pounds per square foot while Alberta building codes require a minimum of 22 pounds per square foot for residences and small commercial buildings alike. If a roof is at a unique level, and/or there are projections above the roof level, the roof design for snow load shall include allowance for the effects of drifting snow. Do you know what the specified load is for your lean-to roof, flat roof with projections, or peaked/curved roof? Has it been constructed to account for this load? Bottom line, is that you should never let it get to the point of concern. Perform weekly snow removal, and if there has been a run of days of heavy snowfall, have the snow removed as soon as the weather clears. If you operate out of a small detached building, a roof rake and/or shovel may do the job just fine, but for more expansive properties you may need to bring in a snow removal professional for regular maintenance. Nothing will prepare your commercial building for harsh winter weather quite like a metal roof installation. But is a retrofit viable this deep into the season? There are several variables in play that can affect how long it takes to complete a metal roof installation, including the size, style, and slope of your roof, in addition to the presence of features such as chimneys and skylights. And of course the short term weather forecast will dictate the timeline too. You could be looking at a new metal roof within a few short weeks, or more. Find out how long it will take to install (or repair?) a metal roof on your commercial property in Alberta by contacting Apple Building Systems today. Whether you’re retrofitted with a new metal roof in time for this winter or the next, you will gain longterm peace of mind in knowing that your property is prepared for many winters to come.